Exterior view of Myrtle Villa, the estate of Italian Canadian businessman James Franceschini. The estate is located in what was formerly the Town of Mimico, now east Toronto. 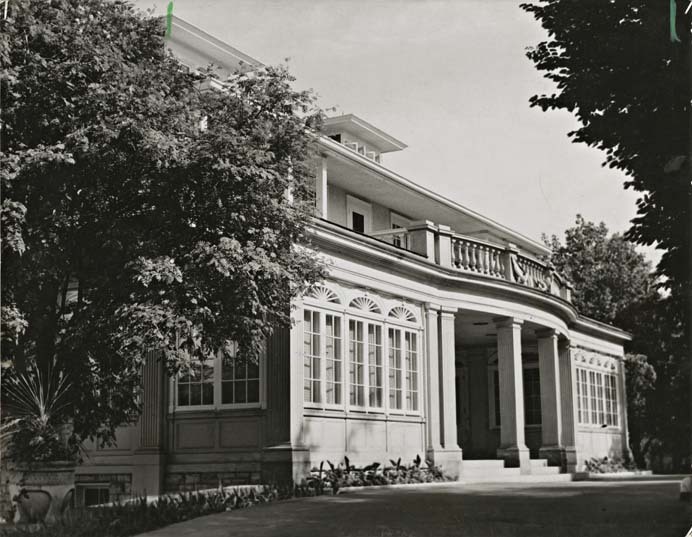 Franceschini purchased the estate in 1925 for $68,000 and renamed it "Myrtle Villa" in honour of his only daughter Myrtle. In 1940 Franceschini was arrested along with hundreds of other Italian Canadians and interned in Petawawa. During their internment the assets of most of internees were seized by the Custodian of Enemy Property. In Franceschini's case the Custodian of Enemy Property seized Myrtle Villa and sold his show horses and the entire contents of his greenhouses. In 1950 Franceschini sold his estate to Longo Construction for $125,000. The estate has now been converted into an apartment complex.